Beth's designs are inspired by traditional textiles, paper cuts, and woodcarvings from around the world. 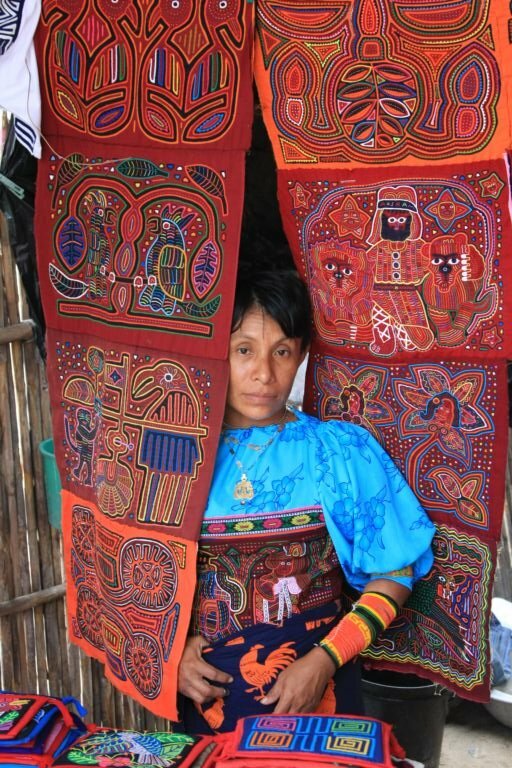 An artist from the Kuna tribe displays her handmade molas in the San Blas Islands of Panama. Beth bought her first Mola from an antique store in Sellwood. She was intrigued by the colors and the layers that were used in creating this artwork so sought out to learn more about where it was created. A few years later Beth spent a few days on the San Blas Islands in Panama where she watched the Kuna women creating these amazing textiles. Her dream now is to sit alongside artisans in Bali to learn about their textile printing process. Colorful "papel picado" line the central plaza in the old town of El Cedral on the island of Cozumel, Mexico. Paper cut images can be found around the world from China to Mexico. These papers cut by hand are intricate and take an incredible amount of time and patience. A few years ago Beth bought a set of three large paper cuts from a thrift store for only $15 and they are now framed and hung over her couch in her living room. These paper cuts were made in Guatemala and she hopes to one day travel there to find more beautiful hand cut treasures. After cutting many papers by hand, Beth has learned how to make even more delicate paper cuts by using the technology of today, the laser cutter. An upeti board that Beth made on the island of Samoa at the Tiapapata Art Centre. Upeti boards are carved and used to print textiles that are then made into a traditional lavalalva or sarong. Beth's undergraduate fine arts degree focused on sculpture, and specifically wood working. She created a "Toy Table" and many wooden toys. She has collected wooden treasure from her travels and continues to dream about one day having her own wood shop. Until then, you will see her experimenting with cutting wood with the laser cutter.